Explore ancient Chinese wisdom, and discover whether times of financial crisis might actually be an opportunity. Learn the dirty little secrets of the financial industry. 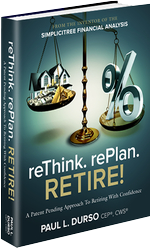 Finally, make sure you never make certain assumptions about retirement. Learn financial lessons from some of the richest musicians in history. We’ll also find out whether Paul and Charlie could be elected to the hypothetical office of a financial advisor. Get philosophical, and ponder important financial questions. We’ll also give you the good news and bad news about your finances. Learn the different types of risk that could affect your portfolio. Get a gut reaction from Paul and Charlie on some crucial statistics. Finally, we’ll give you three qualities of money.